The following short story was based on the visual writing prompt of the swamp. While everyone in my writing circle wrote lovely stories, mostly fantasy, that would delight readers of any genre, I took one look at the picture and decided upon a different tale. I’ll withhold my comments on why I wrote what I did until after you’ve read this piece. I want your unbiased opinion toward the story, so please be sure to leave feedback in the comments section. Zach stomped into the clearing and threw his book bag on the ground with all the force he could muster. He proceeded to kick it hard, heedless of the laptop inside. Two more kicks landed the black canvas satchel on the edge of the marsh. “Frickin’ parents,” he screamed, straining his chest with the force. It was the closest his upbringing would allow him to swearing. He collapsed on the damp leaves, his legs crossed awkwardly beneath him, the sound of blood rushing in his ears, and sat perfectly still until his heart stopped racing and his ragged breathing slowed. Feelings of self-pity began to sting Zach’s eyes, but he refused to indulge in tears. Instead, he stood to retrieve his book bag from the water. Soggy homework, folders, and the papers he had stolen that morning from his father’s desk were removed and littered across the forest floor. He inspected his laptop for damage. Moisture hadn’t seeped into the computer case which had been shielded between his algebra and chemistry books. The books had not fared so well; water leached an inch into the pages, darkening the edges all around. “Whatever,” he mumbled, stuffing the laptop and ruined books back into the bag. Zach slung the bag over his shoulder and took several deep breaths. For the first time, he observed his surroundings. 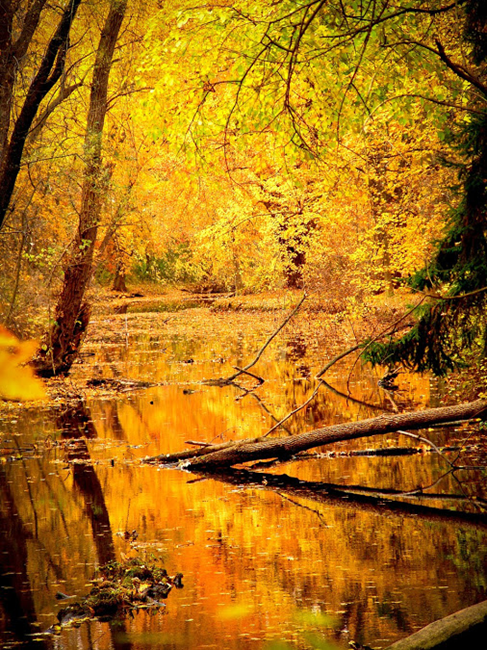 The beauty of the golden foliage sickened him. His mouth curled upward in a lopsided sneer, and his fingers caressed the lighter in his pocket. The blaze would have been spectacular. Even though there wouldn’t be any witnesses, these events had a way of producing detailed accounts. People would be enraged when their forest succumbed to destruction at the hands of an unknown arsonist. They would swear they had seen the culprit and go so far as to describe him. Ripped jeans, a dark hoodie, both arms tatted up, and multiple piercings would be just a few of the descriptors they used when speaking with the local media about the tragedy. They would mention the exact brand of designer sneakers worn when the vandalism took place. Someone would inevitably mention that drugs were involved…probably. The worst liars would make subtle remarks that cast aspersions on the perpetrator’s possible ethnicity. Zach sighed, his anger spent. He brushed leaf litter from the front of his school blazer and swiped the sides of his mud-crusted dress shoes in a patch of grass. Then he pulled his iPhone from his pocket to check the time. He still had an hour before he had to meet Kevin at the library to study for the AP Chemistry test. One more deep breath enabled him to set out for home where his parents, oblivious to his delayed arrival, would be absorbed in their own pursuits. The scent of decaying leaves reminded him of a smell somewhere between the cherry tobacco in his father’s pipe and his mother’s compost heap. A small flame of resentment flared in his heart, but Zach refused to let it take hold. Zach could be twelve or eighteen, his frustration is real, he is helpless against decisions his parents have made as are so many children. Feelings are deep here. No doubt fallout from the decisions being made my his parents. Destruction, whether real or imagined, is a byproduct which seems a natural consequence when there is a broken heart. So, what was your train of thought in this writing? My first thought was that it would be too easy to write a beautiful story about a beautiful picture. Since I couldn’t make the picture ugly, I turned that quality on the actions of my protagonist. Then I left it up to the reader to decide if he/she felt sorry for the kid or thought he was a punk. Did not see that coming!!! Figured it was some spoiled rich brat complaining about homework. So how do you feel about him now? A riposte to those claiming that divorce does no appreciable damage to a child. You might hope that the sight of a beautiful place might be soothing, but it makes this child angrier than ever. He simply wants to destroy it as a “have back at you” to his parents. Funny (not ha ha) that they won’t let him swear, but inflict damage on him in this way instead. Believable.